Buttons, yarn and material are subject to change, depending on what I can source at the time of order. 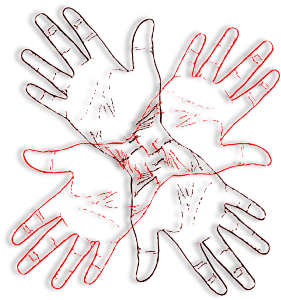 I will send you an e-mail with options or if you prefer you can e-mail me with suggestions of topics, buttons or material you would like me to use. I reserve the right to amend your order depending on choices, you will receive a new invoice and the option of cancelling your order. All items come with a spare button and spare yarn. Knit Only option is available, please ask. Other patterns available. These are great belt clips, they could be used for keys or radios, but I’m sure they have other uses. 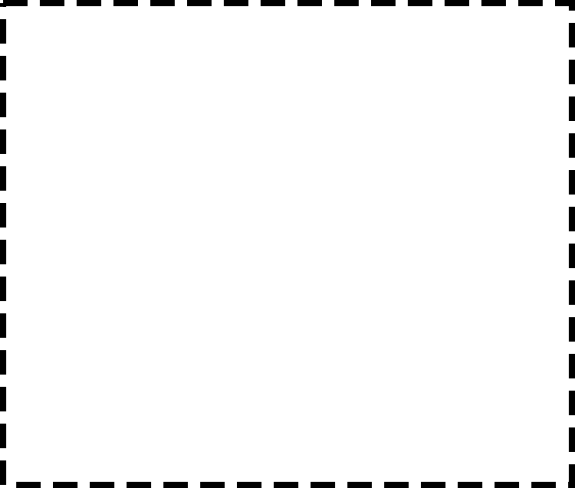 They are hi vis ribbon backed on black polyester webbing with a press stud fastening. You can fully customise your belt clip, you can choose any hi vis ribbon, shown in the photos, your colour clip and press stud,. At the moment I only have black webbing available, which is 2.5 cm wide. 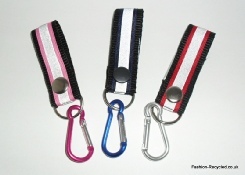 If you would like another style of clip, webbing or ribbon please e-mail me. These are are made of mixed fibre content. 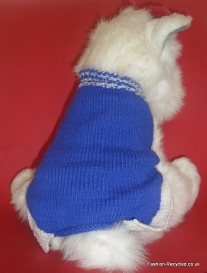 This is a great knitted dog coat, it has a rib neck collar, a plain stocking stitch back and front with a garter stitch border. To help your dog to wear it you need to undo the press studs under the rib cage and place it over the head of your dog, then re-attach the press studs. This is a good pattern to adapt, it can be made in any double knit or aran wool. You can have almost any colour or design, I could even add a motif or wording. Do you have a favourite sports team? I could use those colours and you would have a mascot or extra supporter. Please note that these are the measurements from the pattern and could vary slightly. Fibre: Because of the difference between the yarns, I will have to confirm fibre content with you when I confirm which wool I will be using. 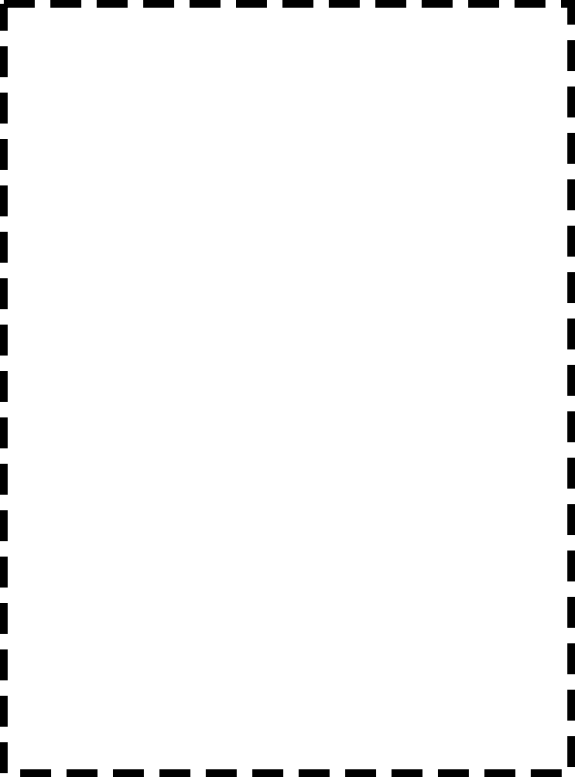 Please fill in the colour box with as much detail as possible, if you have a yarn you would like me to use, please add it in this box. I reserve the right to amend my price depending on yarn requested, but I will send you an invoice with the option of cancelling the order. Make time: 10 days after sourcing the yarn. 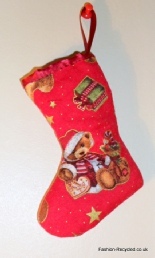 This beautiful Christmas Stocking is made with a wonderful teddy bear design material. It is fully lined with red cotton to match the outside; it is also quilted with 2oz polyester wadding and top trimmed with satin binding. This stocking will grow with your child or any adult would love it too. I have only made 3 of these stockings so they are very limited. Keep away from fire & flames. 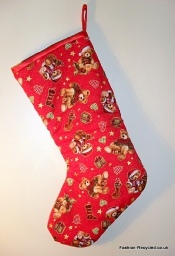 This beautiful Christmas Stocking, is made with a wonderful teddy bear design material. It is fully lined with red cotton to match the outside; it is also quilted with 2oz polyester wadding and top trimmed with satin ribbon. These are ideal for tree prezzies, treat bags or that extra small present. I have only made 10 of these stockings so they are limited. I have tried to get one complete teddy on at least one side of the stocking. 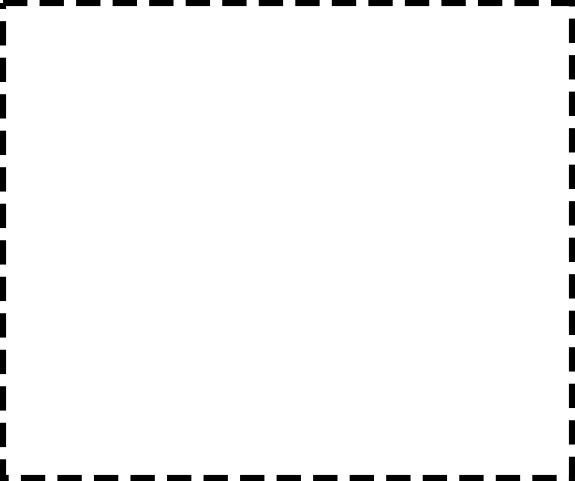 Width (leg): 7cm/ 2 ½ in (the leg does taper towards the foot) wide enough to get 2 adult fingers in.